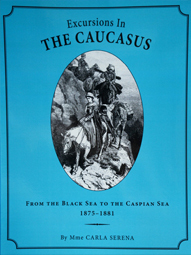 A real gem: Carla Serena's Excursions in the Caucasus, 1875-1881 reveals both an ethnographic and artistic sensibility. Meeting with peasants, inn-keepers, princesses and governors, she provides a fascinating detail on the vast spectrum of life among Georgians Armenians, Greeks and Tartars living in this small, relatively unexplored territory of the Russian empire. The multiple illustrations, taken from her own photographs, are extraordinary. Peter Skinner’s notes and annotations are a splendid accompaniment, providing contest and quirky detail on this truly unusual woman exploring a world just beginning to emerge on the European horizon.